2-way stainless steel solenoid valves for car wash systems. Most types are normally closed (NC = opens with voltage). Normally Open (NO) types also exist and shut off when electrically powered. 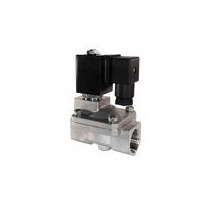 Solenoid valves can be (semi- direct operated (work without pressure differential) or indirect opreated (differential pressure required for proper operation). Stainless steel is durable and generally has a good corrosion resistance. The most common types of stainless steel are 304 and 316, of which the latter has the best chemical resistance. Most valves are available with either EPDM or FKM seals.